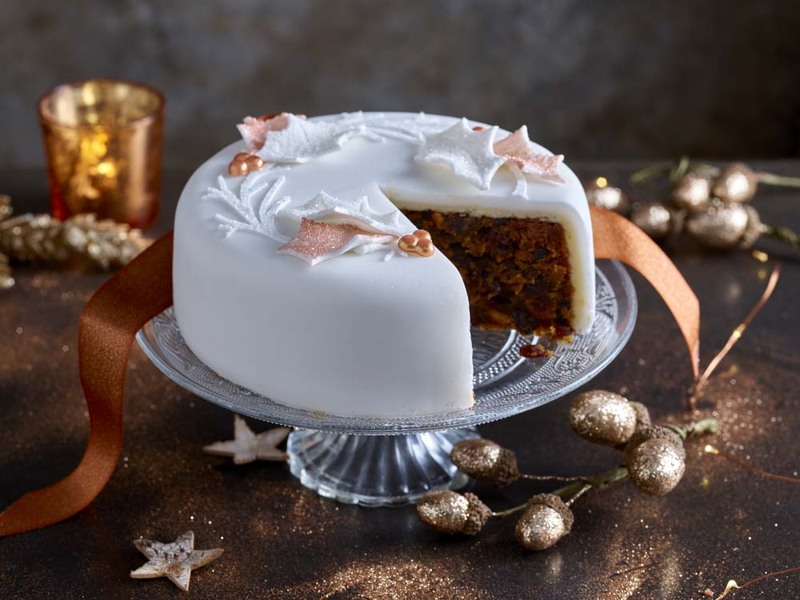 In addition to our fantastic selection of the best of everything you need to buy for Christmas in the December issue, we’re also giving you a bonus look at this year’s crop of mince pies and Christmas cakes that will be on the supermarket shelves. These are all worthy to fit in with our ‘best of everything’ theme – trust us, we have tasted them all! 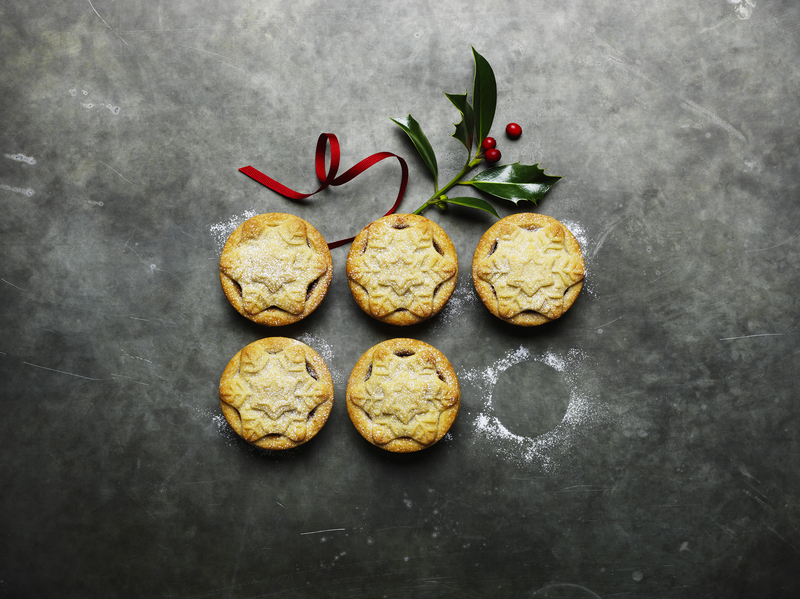 These lovely rich all-butter shortcrust pastry luxury mince pies feature fruity mincemeat laced with brandy and cider with a cut star-shaped top. Great-looking and with a large amount of filling and just a touch of spice and brandy, these all-butter pies are something special, a real joy to eat. 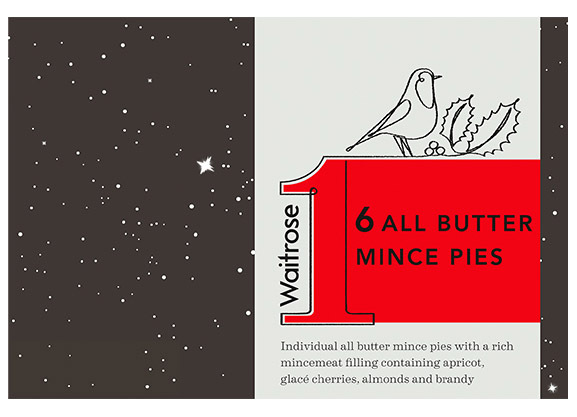 These are good-sized, deep-filled mince pies with a full top of buttery pastry. Scrummy and slightly tangy, possibly due to the Courvoisier brandy that they contain. Super-duper. 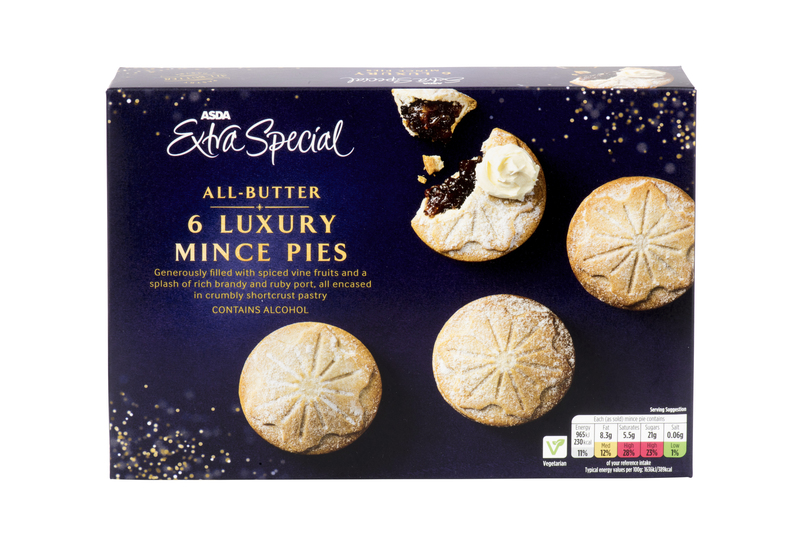 These butter shortcrust deep-filled pies containing cranberries, clementines and brandy are scrumptious and worth that tiny bit extra, as always with M&S. The retailer is also selling a mince pie flavour festive Irish cream at £12 a bottle, which you can drizzle over ice cream or just have as a tipple on the rocks – well, it is Christmas! 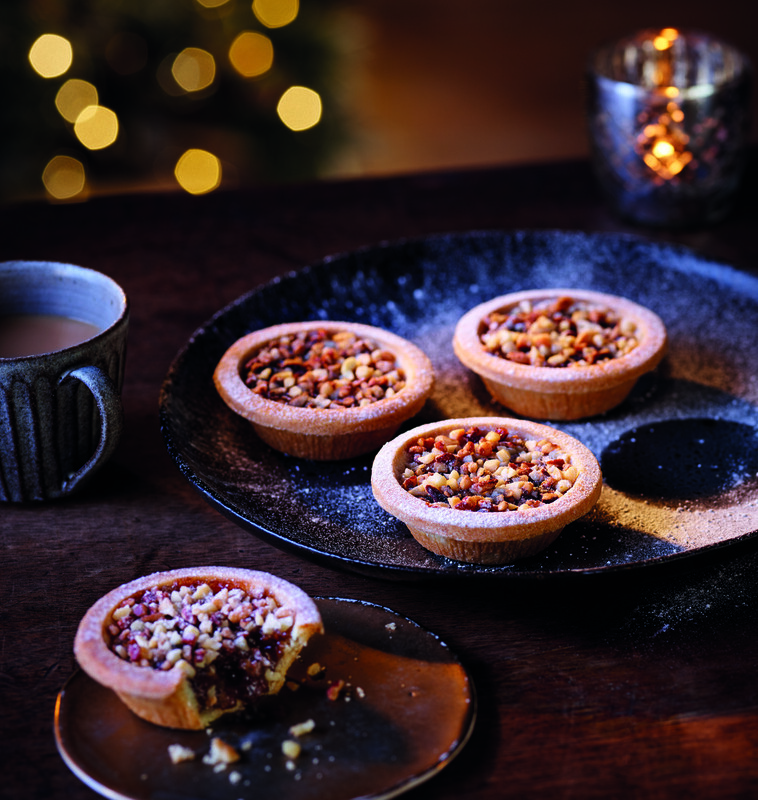 Something a bit different, these gorgeous pies are a delight, with all the usual mincemeat flavours and the distinct but subtle addition of rum and salted caramel. They were gone in a flash! 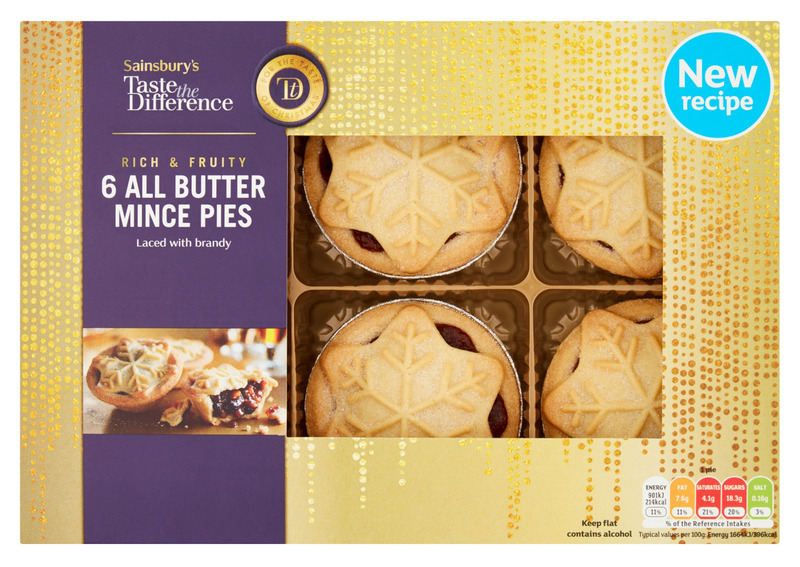 Sainsbury’s has tried a new recipe for its classic mince pies this year, and they are truly gorgeous. Baked in Scotland, they have all the usual fruit, cranberries and clementine juice, finished off with a nip of brandy. 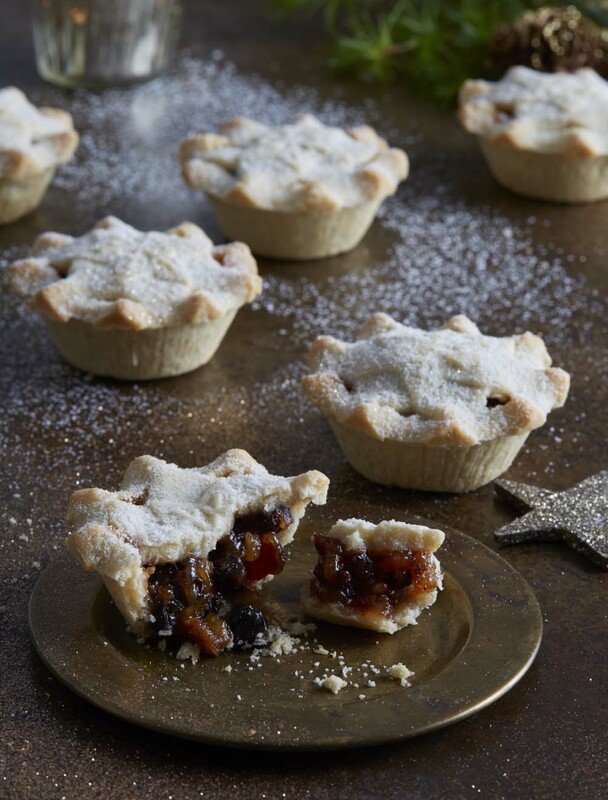 These pies have a very attractive snowflake all-butter pastry topping, and they are generously filled with sumptuous mincemeat with the added treat of brandy and some ruby port, all of which results in a great flavour. 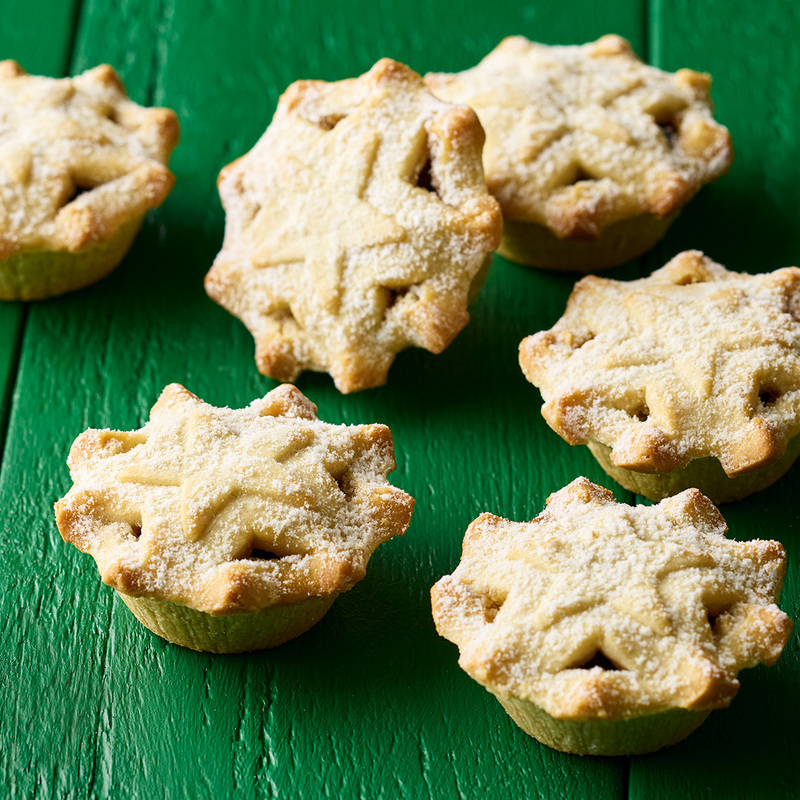 Substantial-looking pies with a snowflake pastry top dusted with icing sugar. They contain sultanas from Turkey and currants from Greece, along with raisins and tangy cranberries, and they also have a splash of Courvoisier cognac. 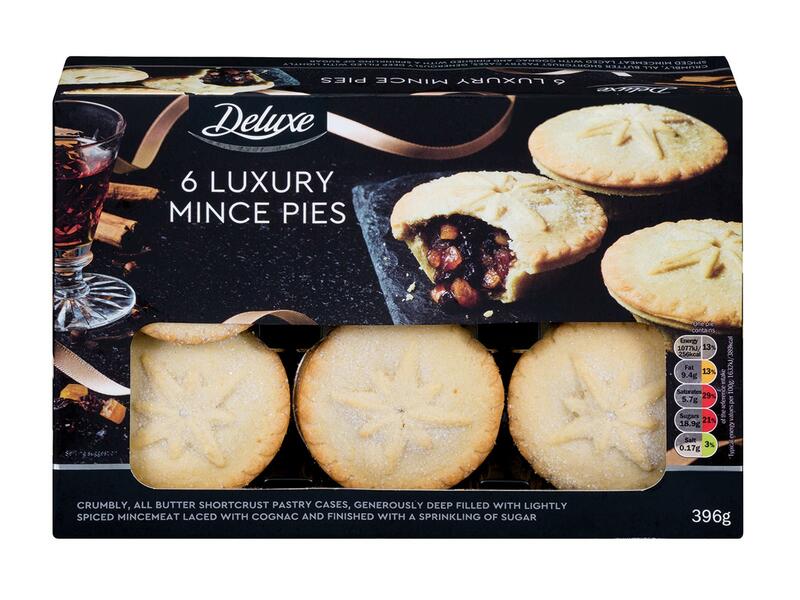 Good classic tasty mince pies with a full top of all-butter shortcrust pastry and a gently spiced mincemeat deep fill. They’re a good size, too. 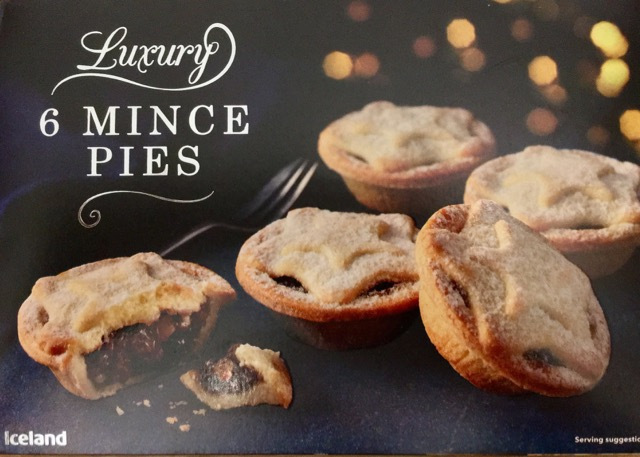 These pies come in Waitrose’s usual lovely packaging and contain lovely rich mincemeat including apricots, making for a lovely sweet and sticky filling, and of course a little brandy. They’re topped off with really good-quality buttery short pastry. 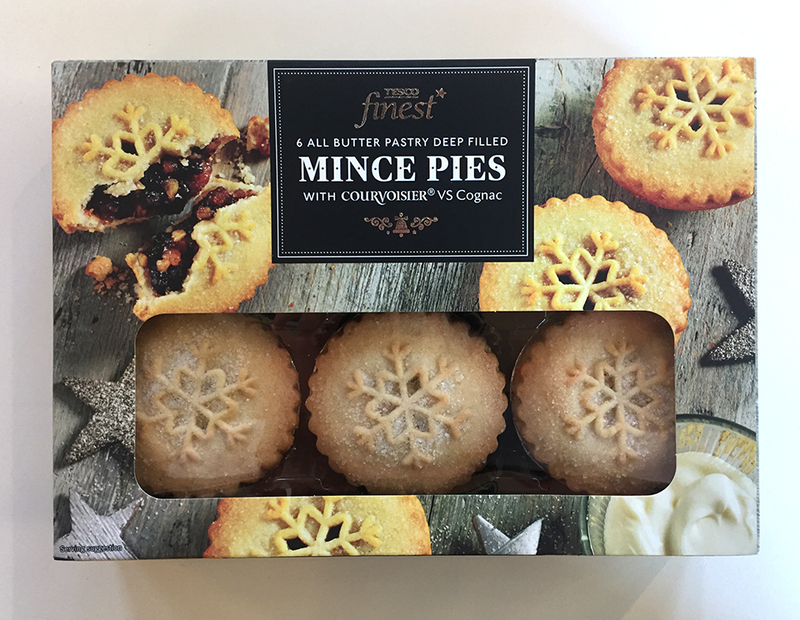 There’s no better time than Christmas to indulge in yummy, gooey treats… Tuck in to these before your new year’s resolutions kick in! 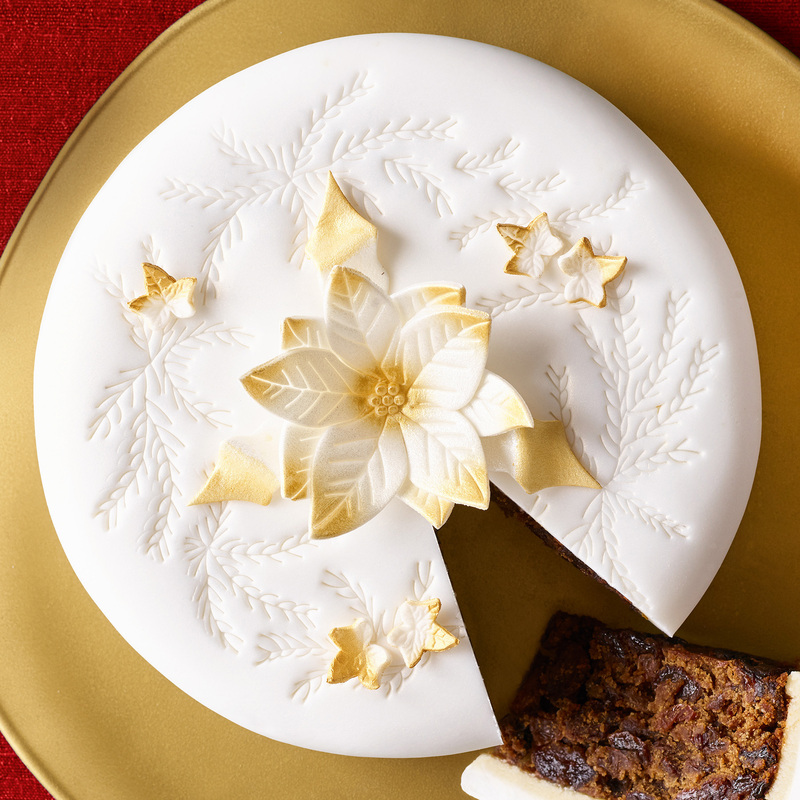 This rich, luxury fruit cake is gluten-free and full of sultanas, raisins and currants plus glacé cherries, brandy and almonds, and is topped with marzipan and a soft icing. Never feel left out when following a gluten-free diet with this beauty. 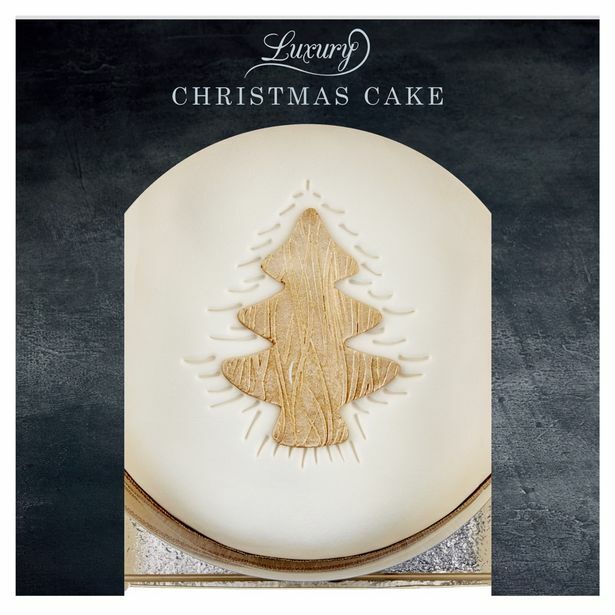 A handsome, rich fruit cake with all-over icing, marzipan and delicate edible decorations. Containing all the fruits and glacé cherries you would expect, it has been oak-aged with brandy and cognac for a nice deep flavour. 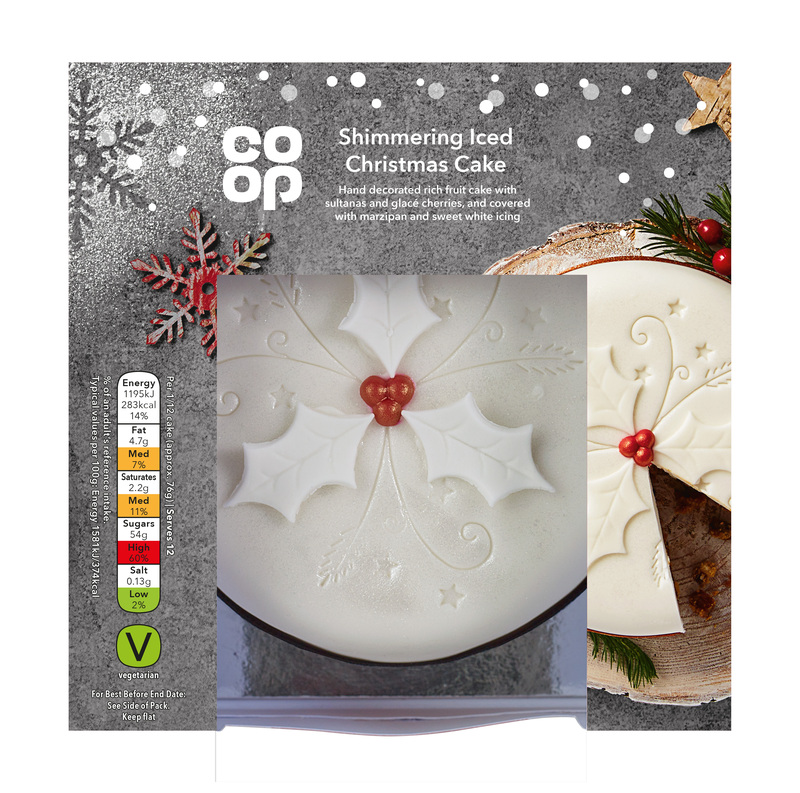 This is classy fruit cake with a gorgeous copper trim, hand-decorated with sultanas and cherries and fully covered with marzipan and icing. This very classy-looking cake is beautifully decorated and all of it is edible. A very fruity all-butter cake with almonds for a bit of crunch and a splash of festive brandy. 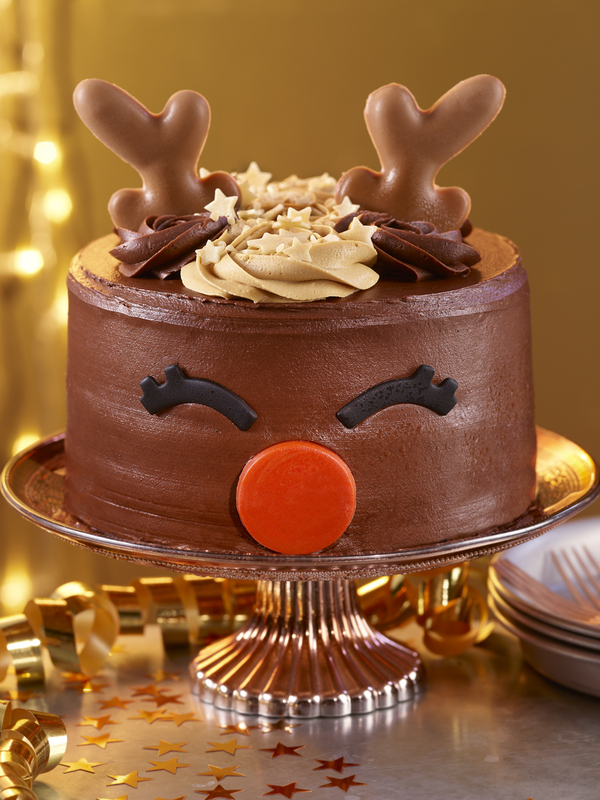 This cake is so cute with ears made of chocolate and a red nose. A multilayered chocolate sponge covered in chocolate frosting all over and with caramel buttercream rosettes on top, this would create excitement at the centre of any Christmas table. It very generously serves 16. 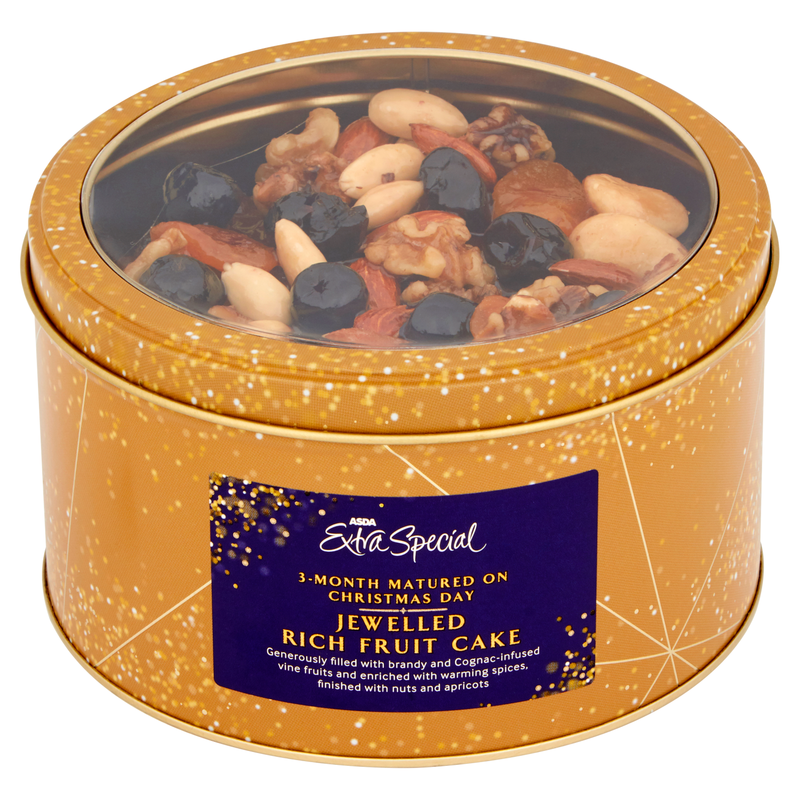 This rich, gorgeous-looking fruit cake comes in a pretty, Christmas-themed tin, making it an ideal gift choice. It has a most amazing jewelled topping with glazed apricots, walnuts, whole Brazil nuts and black cherries that will bring Christmas sparkle to any festive spread. 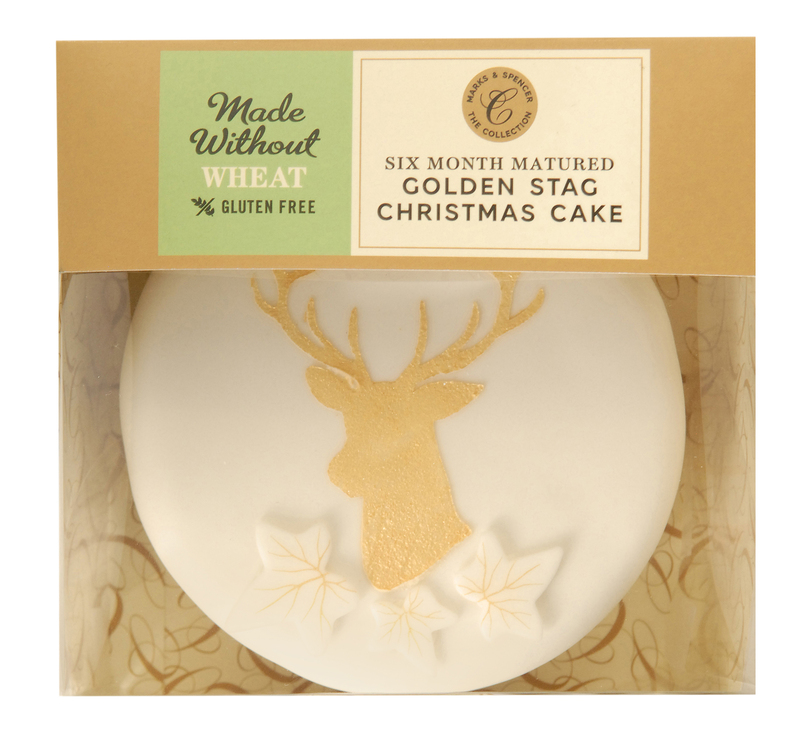 It’s infused with brandy and cognac and matured for three months – perfect for Christmas Day. A substantial and handsome fruit cake that is hand-decorated all over with soft icing and elegant icing leaves. Featuring all the usual fruits plus hazelnuts and almonds, it is matured for six months with Grande Dauphine cherry liqueur. A lovely slice of cake. 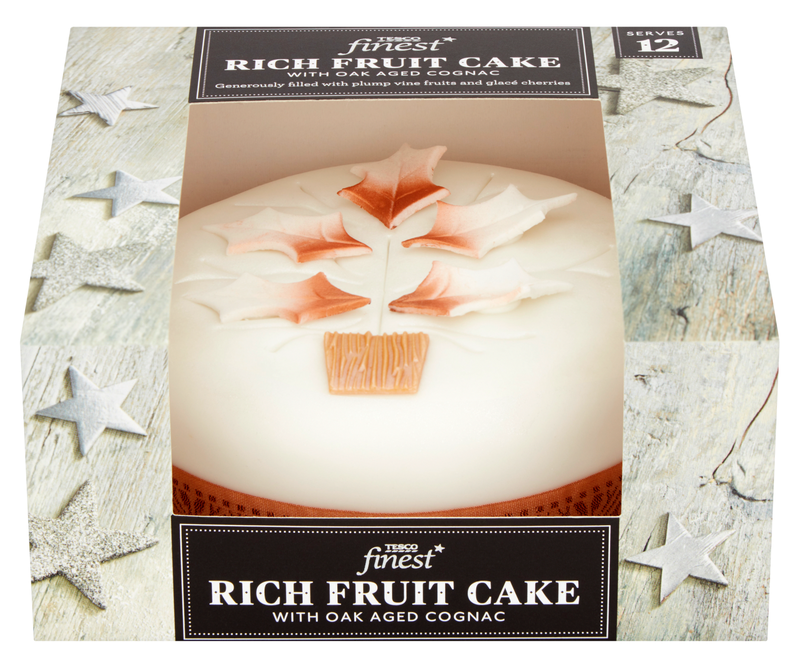 A good-value Christmas fruit cake that is still a luxurious treat with fruit and glacé cherries and mixed peel along with some brandy and cognac. 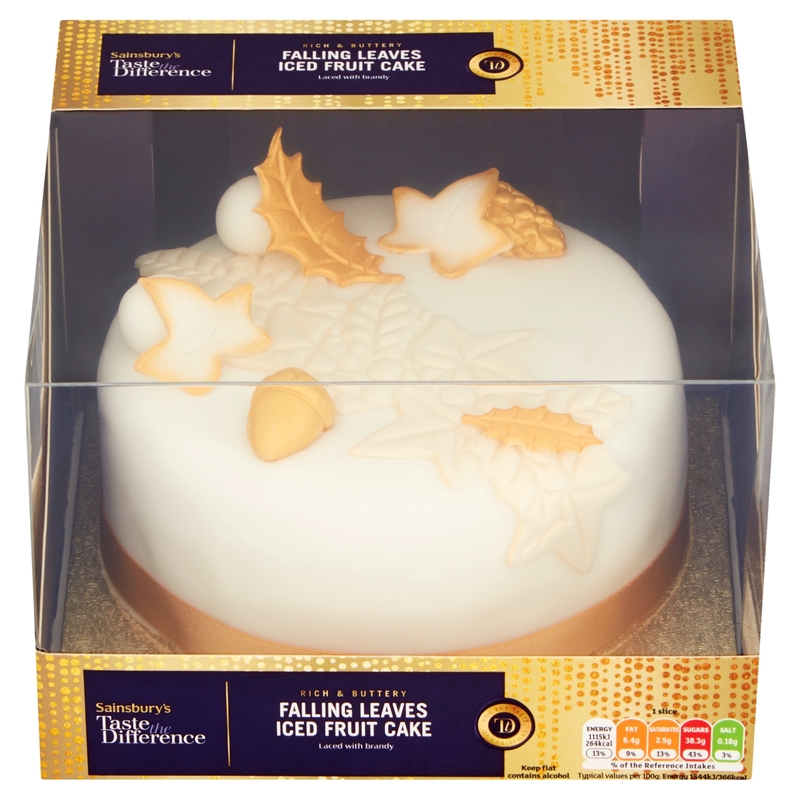 Fully iced, with an edible Christmas tree decoration, this was juicy and glorious to eat. This is a fine-looking fruit cake covered with marzipan and icing and topped with edible flower decorations. It contains lots of fruit plus orange zest and cognac and has a nice bit of spice in there too. Buttery rich and truly delicious, it serves 22 – handy as one slice would never be enough! 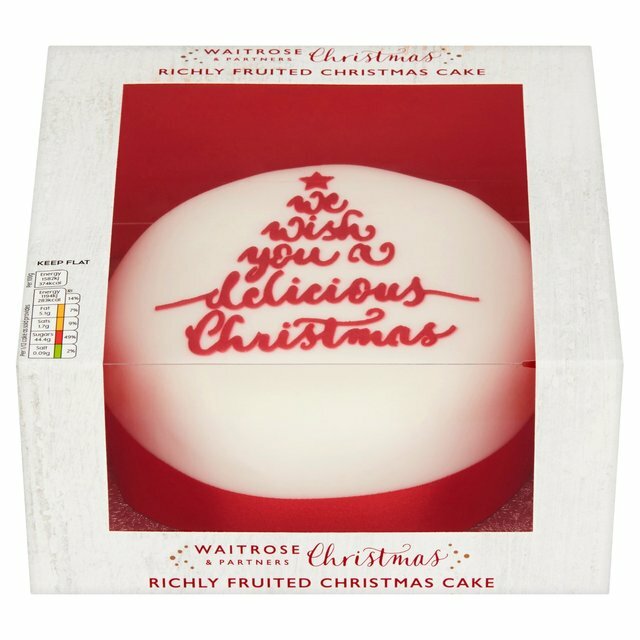 This moist and rich fruit cake comes in a lovely white and red box and is fully covered with marzipan, white icing and a ‘We wish you a delicious Christmas’ message in red – very simple and attractive. It contains sultanas, glacé cherries, raisins, glacé citrus peel and brandy.